IT SEEMS QUITE fitting that during the Cricket Tour of Trinidad to the island that to-morrow night a meeting of the Jamaica Football Association will be held at Sabina Park to consider the already proposed and discussed visit of a Trinidad football team here during the next football season. Special guest to this Council Meeting will be Lieut.-Commander Charles Hayward, haywire President of the Trinidad Amateur Football Association, who has been in the Island from last week and will at this meeting on behalf of his Association, discuss full details to the possibilities of the tour becoming a reality. It will be recalled that the tour was first mooted earlier this year when Commander Hayward was passing through on his way home to Port-of-Spain from England and the suggestion of such a venture was made to him by Mr. G. M. daCosta, 1st Vice-President of the J.F.A. Since then correspondence has passed between the two governing bodies of the Islands and I understand that the J.F.A. has suggested the month of January, 1947, for the two-week tour when fourteen Trinidad players will likely make the trip. 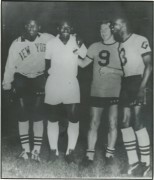 It will be recalled, that a combination from the sister Colony last played here in 1935-36, when Prior Jones, the present Trinidad football captain, and Harold Burnett of the cricket team now in the Island were members of the side. Also on the current cricket side are Jeff Stollmeyer, Gerry Gomez and Andy Ganteaume, who were members of the last Trinidad team to visit British Guiana in March and who are likely to be back here in January, particularly if the Indian cricket our does not come off. The Trinidad football season opened last week Thursday and this fact and the proposed tour to Jamaica given much publicity in the Trinidad Guardian of June 16. A go-ahead colony in organising intercolonial sport, Trinidad at the same time is considering a triangular tournament involving visits to Port-of-Spain by Venezuela, Surinam and the home colony. Trinidad has also formed a five-man committee to enquire into the formation of a West Indies Soccer Board of Control.